This one I honestly don't understand (I am currently neither pro nor con). I understand that Netflix and Google are huge users of content, but how are they not paying for it? Don't they also have to hook up to various ISPs? Aren't they charged for their usage? I pay almost $100 a month for internet and have basically no choice in providers. They are already being paid to deliver content to me. If this were a free market where I could choose between providers - some of whom don't throttle content and others who do - with a variety of pricing to reflect what I am getting . . . sounds great. I don't live in the sticks somewhere. Most people have very little choice in providers. Why bother investing in new infrastructure indeed. The ISP already gets paid for bandwidth used by netflix, by the consumer. ISPs want to charge the customer twice for using that bandwidth, once directly to the ISP and once via the service provider. ISPs, most of whom are some combination of major telco, cable provider and/or media company (and often all three) completely control the "on-ramps" to the Internet. In almost every case, they have either a de facto or (quite often) de jure monopoly or oligopoly on providing this service. In many cases, they also receive subsidies for their infrastructure. If you live in an apartment complex, planned community, or rural area, you most likely have exactly one choice of ISP. If you happen to be lucky enough to live in a high-density metropolitan area, you might have 2-3 choices. If an ISP decides it wants to start privileging content from a particular source (say, for example, the media conglomerate they are aligned with) or throttling content from some other source, there is no market mechanism to stop them. You can't choose to switch to the ISP that is more committed to free content flow. The reason Netflix and YouTube represent the highest aggregate content running over Internet links is simple: They are the content providers most in demand by consumers. That's not corporate welfare, that's consumer choice. Corporate welfare is letting the media companies push their preferred content by getting their aligned ISPs to throttle the content of their competition, and do it over links that are often publicly subsidized and protected from competition. Net Neutrality, at its core, is about preserving the most fundamental routing rule of the Internet: All packets are created equal. And it's about preserving it at the edges of the network, where it's most threatened. The existing FCC classification of ISPs as information providers rather than common carriers has been an absolute gift to the big Internet providers. Netflix & Comcast: Netflix hosts their streaming infrastructure in datacenters supported by Cogent networks. Cogent and Comcast have a peering arrangement, which means at the highest level their networks are connected so that servers hosted by Cogent can reach end users on Comcast, and vice versa. Of note: Comcast has far more residential users than Cogent, but Cogent does more server level hosting like Netflix than Comcast. As Netflix grew in popularity, the peering connection between the two networks was becoming saturated. In order to not impact other customers, Comcast started to throttle Netflix's traffic at the peering point. At this point, service to end users was degraded. This is not an uncommon scenario, peering connections reach capacity all the time. Typically, both networks will work to upgrade the peering connection as it benefits both networks by permitting more data to flow between them. Comcast refused to do this. They felt Netflix and Cogent should be responsible for the upgrade because they were responsible for the increase in traffic. I must stress how unprecedented this is, never before has an ISP held another ISP hostage like this over an increase in peering traffic, which has occurred countless times over the history of the internet. Understandably, Cogent/Netflix refused, and Comcast continued to tighten the throttling. Additionally, Netflix asked for server space in datacenters served by Comcast networks, so that the peering point would not be stressed, traffic would go directly from the datacenter to residential users. Comcast also refused this, citing concerns over their network's capacity to handle the bandwidth. Eventually, Netflix relented and made an agreement directly with Comcast to upgrade the peering points. Never before has a content provider been responsible for such a thing, and why should they be? Cogent and Comcast benefit most from an expanded network, as they can serve more customers with better bandwidth, Netflix just happens to be one of those customers. The comparison to UPS is not really apt here. For one, package carriers do not transfer items between them to get them to the destination, they carry it all the way from sender to reciever. Two, to try and bend an analogy, if UPS's trucks were not large enough to get packages from Amazon to me, UPS would not degrade Amazon deliveries until I paid them to get bigger trucks. The analogy seems incorrect because Amazon is the "content" pusher, so they should be Netflix in this scenario, right? Not really, because Netflix is Cogent's customer, just like I am Amazon's customer, and UPS is the middle man, like Comcast. UPS having bigger trucks will benefit UPS and Amazon because they can both deliver more business, but it really does not do a lot for me, the customer sitting at home. This is not about content creators vs. providers, it's about the structure of the Internet. It was designed to have high level networks (ISPs) that treat all data equally, and exchange all data between them equally. To suddenly start targeting specific portions of data and say they are required to pay more to use the network is to break that equality, and will lead to a fundamental degradation of the Internet. It sets a precedent for holding data hostage and creating a network of ISP fiefdoms where "data dams" can bottleneck the flow of information instead of a flat network where data flows freely. It seems fair to say Netflix uses more data so they should pay more...except Netflix already pays more to Cogent, their ISP, for that bandwidth, why should they be required to pay an additional toll to Comcast on Cogent's behalf? If anybody should be charged more it would be Cogent, but again, peering connections are not supposed to be unequal because upgrading the connection is good for Comcast too, they can now push more data to and from Cogent. This would be the point where free markets come in, right? Comcast is being a crappy business partner, so there should be an opportunity for a new ISP to come along, not play games with peering agreements, and sell tons of connections to end users by promising the highest possible Netflix quality - everybody wins! Except this is impossible......because of the gov't. Starting an ISP is already a regulatory nightmare because of local governments requiring kickbacks to lay networks, which is why Comcast sits atop a pretty de facto monopoly. (don't worry, they played their part in getting those local gov'ts to capture the market for them) Referring to the title of your post - Comcast et al already get corporate welfare from localities, and are leveraging it against Netflix and Google. Net neutrality seeks to level that welfare out. We have no opportunity for a free market here, which is why people are clamoring for net neutrality. If we want to turn the discussion towards taking the shackles off ISPs to come in and distrupt entrenched interests like Comcast - great! I don't need net neutrality. But since we aren't, and since we are locked into the ISPs we have - we should be forcing them to maintain the Internet as it is designed and has worked for 40 years- equal for everybody - not a patchwork of data fiefdoms where entrenched interests can extort successful businesses for more money to get the same service as everybody else. Seems to me there could be a tiered approach to charging that puts more burden on high bandwidth consumers. On the flipside, I could see Netflix and Google getting a great deal on bandwidth, but this become a barrier to entry for other fledgling services. Not saying the market shouldn't be free on this. ... Just saying there is an alternative that seems to undermine the argument that it would bankrupt the cable companies. Your argument is reasonable, but when you go down the we already have a distorted market so let's distort it more argument, you eventually end up with a full-fledged socialist government. Let's use our resources to un-distort the market, not to distort it even more. Generally when the government passes stupid legislation, it's in response to a legitimate problem which the government believes they can magically take care of. What's completely mind-boggling is that here we have government legislation for a problem that doesn't exist. The internet is the single-greatest invention in a very long time, it works so amazingly well, who the hell wants gov't to come screw this up?? While I usually agree with your analysis on many things (I've read this blog for awhile), I'm afraid you have some facts wrong here. Netflix, et al *already do* pay for their bandwidth. Netflix, for example, pays Cogent Communications for it's links. The large "tier 1" ISP's, like Cogent, Level 3, etc. settle their payments between each other with "peering agreements" where they split the difference in their traffic (basically it's "You carry X traffic for me, I carry Y traffic for you" if X and Y are roughly equal, then they call it even, if not, the overweight side pays for the imbalance). And finally, Time Warner, Comcast, etc get paid by their subscribers. The reason *I* am somewhat skeptical of all the Net Neutrality talk is that, for one, I simply don't trust the government to implement such regulations without things getting much worse (such as massive regulatory capture by the same cable monopolies people are complaining about now), and two, because it's treating the symptom, not the cause. The cause, as is so often the case in these things, is government-granted monopolies and regulatory red tape. In this case, it's at the municipal/local level, regarding the "right-of-way" access. While running the necessary fiber/wire to customer's homes is not cheap, in any area with reasonable population density, it's not out of line either (estimates for fiber run $300-$700 per customer for initial install of the network). The problem is the access to the public rights-of-way (phone poles, utility easements, etc) needed to run the cables are controlled by the local municipal governments, and the various permitting requirements, indefinite review periods, red tape, political palm greasing, not to mention outright monopolies granted to incumbent cable providers in many municipalities, all of which will likely be utterly different for each local government you may have to deal with, are enough to turn an already capital-intensive business proposition into "Not gonna happen". Thusly, the incumbent cable providers have increasing de-facto, if not de-jure monopolies, and can get away with this nonsense. If it were less of a political hassle to run cable, the incumbents would have more competition, and would lose customers if they tried to pull many of the things they've done. Why not use this as a leverage point to de-regulate the cable industry? Similar here. In a post above I have a link...indeed, Netflix, at least, is paying. There seems to be several complications to this that don't fit neatly into one box or another. Google and Netflix do indeed pay for the bandwidth they use, as do their customers. Internet Service Providers, however, would like to charge google and netflix for bandwidth used by the customers, essentially getting paid twice for the same bandwidth. This would not be such a big deal if ISPs were not a monopoly in many areas of the United States; in a free market, the customer would be free to choose another ISP and the ISP would be unwilling to drive their customers into the hands of their competition. The real solution is freeing the market up, not more regulation. "run $300-$700 per customer for initial install of the network"! Really? That's touching the cost of the latest iPhone 6, no contract. "Netflix, et al *already do* pay for their bandwidth." The problem with this argument, is that Me, you, Netflix, and all other ISP customers are really only paying for the bandwidth between us and our respective ISPs. This doesn't cover the cost of the level of backbone bandwidth needed for for more than a few percent of that ISPuser bandwidth to be active at any one time. "who the hell wants gov't to come screw this up??" No one wants the government to come screw it up. The problem is that a lot of people believe with the fervor (and half the evidence) of a religious fundamentalist that the government can make it better. See my reply to Milton above. You fundamentally misunderstand what Netflix pays Cogent for. If ISPs charged their residential customers enough to fully fund the necessary ISPISP backbone bandwidth needed to support even 50% average utilization of their customer's ISPuser bandwidth, no one would be able to afford broadband service. The problem is who funds the necessary ISPISP backbone bandwidth necessary for more than a small fraction of the ISPuser bandwidth to be in used at any one time? If the ISPs charged enough for residential broadband service to fund enough backbone bandwidth to support 24/7 full capacity utilization, no one would be able to afford residential broadband service. I read Bam is for it. One really good reason to be against it. Comcast has never directly received more revenue for carrying more peered traffic, yet it has no doubt upgraded peering connections many times in the past. Upgrading peering is a capital investment that will result in increased revenue over time by having better capacity for the entire network, it doesn't have to be a direct revenue stream, it never has been. "And that is one strategy for dealing with this problem of the government tilting the power balance in a vertical supply chain: vertical integration." This makes no sense. Google is having the balance of power tilted in favor of their level of the supply chain, so this makes them *more* interested in investing in the other levels instead? Here's an alternative theory: AT&T is already making money as an ISP in many markets and has no direct incentive to offer higher speeds; Google is not and does. AT&T announced Gigapower in Austin shortly after the Google Fiber announcement for Austin, not because a market with a solid competitor is more profitable to AT&T than many alternative potential markets with no competitor, but because because the competition makes Google Fiber less profitable, and successfully deterring Google Fiber expansion would protect their current profits elsewhere. But dumping can't last forever; whether their bluff gets called or not they eventually have to return to more directly profitable strategies. The issue is that bandwidth usage is calculated with users needing X amount of bandwidth for Y amount of time. And streaming services use n*X amount of bandwidth for m*Y amount of time where n and m are much greater than 1. The expected usage is outside the assumed usage pattern and ISPs are left in the position of charging users for their actual usage or throttling high-bandwidth sources at the backbone connection, or more complicated solutions. Er, the tier1 ISP's like Cogent *are* the backbone. I'm seeing this as a Marginal versus Fixed Cost problem. Google and Netflix are paying the marginal costs for the bandwidth they're using, but those marginal payments don't immediate cover the upfront fixed costs of infrastructure. The users don't immediately cover the upfront costs either. However, those services are requiring more upfront cost from the ISPs before the ISPs have had a chance to recover the fixed costs of earlier infrastructure investments. So, shenanigans ensue. While a debate about whether Google, Netflix, Amazon, etc. should be paying more or not is interesting, the bigger issue that I have with this proposal is the notion that the government (nominally the FCC) will now have regulatory authority to do all kinds of damage. The first thing that will happen is innovation will slow. Companies will shift more resources to lobbying for favorable regulations instead of into improving their product. Regulators are by nature cautious. If a new idea come forth regulators will have to ponder it. Current companies will lobby against it, etc. Witness what is happening with taxi regulation and companies like Uber and Lyft. The entrenched monopolies, having captured the regulators, fight tooth and nail to restrict entry into their space. Another dangerous issue is control. Is there any doubt that if the FCC had more control over broadband that something like Wikileaks would be at risk? Claims of national security would ring out and the FCC would be pressured to do something about it. Just look at Nipplegate. We already have members of the FEC looking to clamp down on political bloggers, do people really think that the FCC wouldn't be pressured to do something about that as well? This whole idea simply plays to the utopian fantasy of progressives that we can have "enlightened regulation". This is just another example of progressives chasing unicorns and politicians scheming for ways that they can gain more control by appealing to progressive fantasies. The only people who benefit from this proposal are politicians, regulators and lobbyists. Comcast could charge their high bandwidth using customers more. The demand is driven by Comcast customers, not by Netflix. The fixed costs were, arguably, covered by $15/min long-distance rates. The upgrades to that infrastructure happened during the .com boom and resulted in much of the dark fiber that still exists today. I understand what you are saying, but I can't buy the argument that there isn't enough money already in the income stream to pay for upgrades to the hardware. Several recent issues, including known bugs with 12 year old Cisco hardware, have shown us that certain ISP's are more interested in spending that revenue on lobbying than they are on infrastructure upgrades. But, they aren't transparent enough for me to say with certainty one way or the other. That bandwidth is being paid, though. The content creators pay to get it on the Internet. These are the upload fees we pay at the sites where the servers are hosted. The decision made awhile ago was to charge the business (usually the uploader) for the actual bandwidth used and then charge the consumer (usually residential) a flat fee for the pipe itself. This makes sense to me because the highest cost on the residential side is in the long strings of copper and fiber, not the port capacity. On the other side, the cost is in the hardware that has to push a lot of throughput. This bandwidth actually becomes less and less as it gets further from the provider and closer to the individual "house" that is asking for a specific piece of content. Right? Of course, we actually pay for multiple connections with multiple providers (the pipe and the bandwidth) with a fixed cost portion of the bill covering the max rate limit commitment from our "onramp provider," ensuring that we can push up to that amount of traffic at one time. I pay my ISP for access to the world. My ISP is supposed to use that money to build adequate connections to "the world." I would not be interested in an Internet subscription that required extra payment for interesting content--that is the cable monopoly model that we have all been trying to get away from. They own the back bone, but if they tried to sell service to their customers priced so they could fund building enough backbone so their customers could use 100% of their bandwidth 100% of the time with zero congestion, no one other than large corporate clients could afford it and companies like Netflix would go out of business because they would have no customers. The problem is, you are only paying a small fraction of what you would need to pay for your ISP to build enough connections to "the world" for you to use 100% of your connection 100% of the time. I'm a network engineer with 25 years experience, so I'll go ahead and throw in my $.02. I pretty much agree with all of this. Traditionally, each party pays for their end of the Internet connection, and Netflix does pay for their end. Netflix could be a bunch of abusive pricks about how they handle their end of this, but from all reports they are more than fair in their dealings (including offers to put content caching boxes inside of consumer ISP networks, considerably reducing their bandwidth costs). The consumer ISPs are essentially demanding that they get paid twice. 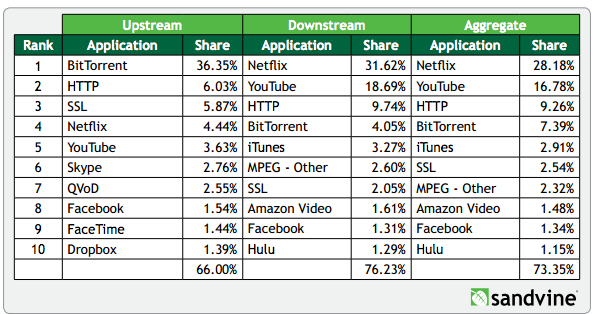 That being said, streaming video has changed ISP economics considerably - it used to be that a relatively small portion of users were downloading several gigabytes per day, and now pretty much everybody is. It's also eating into the traditional revenue streams of the CableCos, and paying $200 per month for a bunch of channels with nothing good on is becoming a dead business model (nice while it lasted). Of course, as mentioned, TelCos and CableCos are about the furthest thing there is from a free market, so it's pretty hard to say what the real prices should be at their scale. On a purely technical level, Net Neutrality is idiotic. It's basically saying "Shove dumptrucks full of money into your network until people are happy, then they'll demand more next month. Wash, rinse, repeat." This takes an already capital-intensive business and makes it much more so, and if your long-term goal is more competition than this is one way to ensure that doesn't happen. The truth is that some packets are more equal than others. The importance of delay, jitter, and loss depend on the application. Prioritizing some packets over others lets you accomplish more with less equipment and fiber. On a real-world political level, though, consumer ISPs abuse this in just about every way imaginable - from artificially throttling services that hurt their other revenue streams (Netflix) to injecting reset packets to kill data streams they don't like (Bittorrent) or even inserting their own ads into web pages (arguably in violation of the web site's copyright). Consumer ISPs act like a bunch of monopolistic pricks, and if you don't like it you can tie two cans together with a string and start your own phone company. Or write them a letter and tell them how angry you are, or jump up and down and scream and shout and bark at the moon. Whatever. What we need to do is get rid of telecom and cable franchises - over 50% of American households are governed by these, and they make effective competition illegal. Net Neutrality will not fix the problem, unless you think the problems of regulatory capture and mysterious briefcases full of cold, hard, cash (not to mention campaign donations) will go away because magic, wishful thinking, and unicorns. All Net Neutrality will accomplish is to freeze these monopolies and duopolies in place. You have companies like Google itching to jump into the ISP space. Apple's revenue is also indirectly tied to Internet consumption and while I doubt they'd jump in themselves, they have proven themselves willing to shove massive cash infusions into other companies to move the markets to where they want them. It may make sense for Netflix to become its own ISP (or band together with Hulu and the other big streaming services), etc. Real competition will both solve the problem as it exists now, and automatically adapt to solve whatever problems pop up in the future. Regulation pretends to solve the problem now by paying no attention to costs and efficiency, and then gums up the works for whatever else we run into. As far as I'm concerned this argument is balderdash. Netflix does not use huge amounts of bandwidth; in fact, except when it sends out e-mail, it doesn't initiate connections at all. All those "huge amounts of bandwidth it uses" are in fact the ISPs' own customers using the bandwidth that they already pay the ISPs to provide to them. (1) AT&T, Verizon, and the other major ISPs want the good PR from offering an "all you can eat buffet" (unlimited bandwidth) without the duty of actually providing it, at least to people who will consume the most from it. The answer here is simply for the ISPs to abandon "unlimited" plans in favor of some reasonable limit per month, with expressly agreed consequences (either extra charges or "throttling") imposed on those who go over the limit. It may or may not be practical also to have bandwidth at "peak" times of day cost more than at off-peak times. I don't see this as a hard problem. Preferably, the ISP would also provide a "meter" application or web page that will allow the user to find out, reliably, when he's getting close to the limit. (2) AT&T, Verizon, and the other major ISPs are trying to leverage their control of Internet backbones (and the lack of real competition with themselves, for most small customers) to be able to control, interfere with, and charge for their customers' access to, and relationship with, content-provider sites (including other end users who sometimes act in the role of content providers). This is a monopoly/antitrust problem, which I would address by not allowing any one company to be both a carrier of communications between others and a content provider (and I include other services such as cable TV in that rule). I would also consider imposing telephone-like rate regulation, but only for service to particular end users who don't have (say) at least three service providers to choose from. What I guess I'm saying is I don't want all internet service under telephone-like regulation because it will kill both innovation and expansion, but I do want enough regulation that people like myself who have access to only one provider (at least for the "last mile") don't get screwed. Very true, but there does have to be a revenue stream to pay for it somewhere. The whole net neutrality fight is over whether the high density content providers or the high density content consumers get to pay for that network infrastructure. If net neutrality as the current administration envisions it gets enacted, be prepared for the cost of your internet connection to increase drastically. That's called 'oversubscription'. And while the consumer-level cable ISPs *are* heavily oversubscribed, commercial tier1 ISPs work differently. If I buy an X Gbps link from a tier1, I'd *better* be able to push X Gbps down that pipe whenever I need to. That's what I'm paying for. Bandwidth at that level is cheap and plentiful. (And it's that way because it *is* priced to fund the needed buildout) It's the customer level cable ISP's that are bottlenecked. Well, I did have the option to dump Scamcast for Century Link. I did. Precisely because of the garbage they pulled last winter. "I'd *better* be able to push X Gbps down that pipe whenever I need to"
Is not necessarily the same as being able to have X Gbps going out continuously 24/7. Not even the corporate clients are paying enough to support that across the entire net. Yes, Coyote, you're usually right but you've got cranial-rectal inversion on this matter: it's not "Netflix and Google" using all that bandwidth, it is home ISP subscribers... who pay for it up front! Please THINK for a moment-- does Netflix send streams of packets to people who don't ask for them? No! So what about Netflix subscribers... aren't they ISP subscribers too, and first? Yes! When Comcast offers me "Comcast Xfinity Blast 105 Mbps Home Internet Service" for $80/month, just what am I buying? I'm buying the right to pull data from (e.g.) Netflix at 105 Mbit/sec! That means I have PAID Comcast to accept data from Netflix' backbone and deliver it to me! Ditto with Google. Please, Coyote, when you write "Netflix, for example, takes a huge amount of bandwidth that costs ISP's a lot of money to provide" you sound incredibly foolish. ISP's bill their subscribers for all of that money (and if their charges don't cover their costs to provide the service they promise, then they are either fools or fraudsters). Comcast simply wants to leverage its local monopoly to extort part of the value of something ("Internet content") it doesn't provide but has the technical ability to degrade. Comcast wants to be like Denmark in the era of the Sound Dues, robbing people who pass under the guns of their forts simply because they have no other way to go. We know for sure that ISP's like Comcast have already gotten their share of the global cost of providing "bandwidth" for "content" because they explicitly sell asymmetrical service (like "45 Mbps down; 3 Mbps up"). What's the point of an asymmetrical service? The point is that the subscriber uses it to fetch "content" from a provider like Netflix or Google. ISP's like Comcast which deliberately throttle the delivery of packets from Netflix in order to extort payments from Netflix (the cost of which Netflix must pass on to its subscribers) are simply crooks, billing twice for one service by out-and-out extortion, and laundering the second payment through an unrelated party such as Netflix. Do you think it's okay for Comcast to defraud its customers, selling them "high-speed Internet" but charging them too little to actually defray the cost of supplying that, making up the difference by extorting money from Netflix which will pass the cost back to Comcast's subscribers? Why should a local monopolist get to launder its prices through reluctant third parties? All that does is discourage competition in the residential ISP market while imposing deadweight losses on would-be customers of "content providers," since (e.g.) Netflix' subscription fees end up including payments to ISP's which any given subscriber may not even use. And in the old days, you probably thought you paid for an unlimited telephone connection for your land line. But you didn't - the phone company only provisioned enough for about 1/7th (IIRC) full time usage. The issue is not the long distance fiber, it's the "last mile" problem. The heavy infrastructure cost is in delivering to each home and business. The ISP's fronted that cost, and expect to get a return on that investment. Treating them like a commons, where they have to carry any and all traffic, no questions asked, is a great way to incentivize them to not invest in infrastructure, and rather spend their money and time on regulatory capture. Many have suggested that the ISP's charge on a usage basis. That makes a whole lot of sense, and the fact that Netflix and Google are not pushing for this shows the dishonesty of *their* position. They stand to lose customers if those customers pay by the gigabyte, so they want the government to give them a free open road to the subscriber premises. A question: a friend who has looked into this asserts that the ISP's have such a huge surplus of bandwidth within their networks that the idea of charging Netflix (either their users or the content provider) makes no sense. I have trouble believing that, on simple economics grounds, but I may very well be wrong. Can you provide information, from your experience, as to the real situation - and if there are bottlenecks and extra cost for the streaming bandwidth, where they are? In our Cox network, vast amounts of fiber bandwidth goes out to neighborhood access points, after which it is distributed over coax. The fiber bandwidth may be effectively unlimited, due to wavelength division multiplexing. A coax cable these days carries almost 1 GHz of bandwidth, and with modern modems with a high bit/baud rate, a heck of a lot of data. So where are the per-gigabyte expenses incurred by the ISP, and how much are they? I don't have any inside info on this on the ISP level, but when we buy "tier 1 bandwidth" we pay $3-$7 dollars per Mbps per month, plus the monthly rate on the fiber for the local loop (generally $1000 - $2000 per month depending on location and infrastructure) - but that's buying hundreds of megabits per second. So we just did one recently at 200 Mbps for $2,400 / month total. The economics of this is that they usually break even in 18 months (infrastructure + provisioning) and then make a profit on you after that. But what you have to keep in mind is that "tier 1 bandwidth" is not like what you can get at home. Retail-level bandwidth is generally crap - sure they can get a gigabit from your house to the street, but you'll generally get no more than 5 - 10 Mbps of somewhat useable service (and sometimes under 1 Mbps, depending on what sites you're hitting). You might get more if there is some sort of local content distribution system. I was sitting in an AT&T data center today, plugged straight into "the good stuff"- 10 megabits of that is probably more useful than a few hundred megabits or a gigabit or whatever that you can get on the retail end. This sounds kind of like the drug trade, doesn't it? Neighborhood traffic isn't the problem - it's getting it in and out of the city. The long-haul links are very, very expensive to provision. The fastest individual links right now are 100 gigabits per second. Sometimes they'll be bundled up into multilink connections, but I'm not personally aware of any long-distance links provisioned at over 600 gigabits per second right now. The biggest useable bundled link that I even know how to make within a campus-sized space is 3.2 terabits per second, and that's with some very, very, very expensive equipment (and no, I've never actually done it). I personally use Cox in San Diego, which is one of the better retail ISPs - but if you add it up there's still less than a terabit per second being divided up between half a million or a million or whatever people (Cox has about half the county, which is a little over three million people total). Anyway, the end of all of this rambling is that nobody on an individual level would even know what to do with a gigabit of good bandwidth if they could get it. In 2014, there is literally no point. You'd probably be in "mind=blown" territory with a few megabits of "tier-1" stuff. Ultra-high quality 4K video with uncompressed sound weighs in at about 50 Mbps. That's the biggest thing I can think of that an average person could actually use on a continual basis. You can fill a 4 terabyte hard drive in just a few hours at a gigabit per second (assuming it's an SSD drive that can keep up with your streaming rate - spinning rust won't). Then what? You can only torrent so much pr0n. ;-) It's nice to be able to download multi-gigabyte .ISO files (which I have to do as part of my day job) in just a few seconds, but it's not like you do that all the time and waiting a few minutes isn't that big of a deal. Oh yeah, one empirical data point we have is the Verizon / Netflix dispute a few months ago, where Verizon refused to upgrade their peering hardware. Once Netflix decided to cut them a check, the problems vanished instantly - so it wasn't a lack of bandwidth. It's more about eating into their traditional profit centers. Streaming media is very costly from a bandwidth perspective, but also lends itself extremely well to local caching. Netflix has some boxes that cost about $40K a pop that can serve up all of their most popular content to a decent-sized community, and they'll more or less give them away to ISPs as needed to support their subscribers (remember: this lowers Netflix's bandwidth bill as well). Agreed. On "retail" or "consumer" bandwidth, the cost is that last mile. If we want to charge content creators to cover the costs of the last mile, then that may be the way to go [thought I would disagree]. But, this isn't about that. They charge the users for the last mile, distributing the cost for a neighborhood or whole city over the entire group of subscribers. When that cost is too high, governments have stepped in and offered to ease the right of way costs a bit or just offer outright subsidies. The issue, I believe, is that the ISP's don't want to charge for usage, they want to charge for a _type_ of usage. I know there are some that support this, but Netflix and Google... not among them. To get an idea of how messed up this is, consider the fact that Comcast is perfectly happy when we use the bandwidth on their network to watch one of their channels. In HD, even. But, there seems to be "limited resources" when we try to use that bandwidth to watch YouTube, Hulu, or Netflix. The backbone and major trunk lines are not capacity constrained, except when done so artificially. This is a profit play. They can't squeeze subscribers for more, so they are going after someone else. There are, in fact, limited resources elsewhere in the system (for example, the costs of pairing).You got good streaming from Comcast because it didn't have to go through a pairing point. However, a recent article shows that Comcast wasn't even doing the throttling - it was the transit provider, Cogent, hired by Netflix. According to the article, Cogent was giving Netflix and other streaming traffic lower priority on *its* network in order to provide what they viewed as overall better service to their mix of customers. But, let's say that the ISP's do have all sorts of excess bandwidth. Why can't they charge for it usage? They spent big bucks, at risk, to build that capacity. Why should anyone be able to tell them how they use it? If you build a toll road and it has excess capacity, does that mean I should be able to drive on it for free? Both ErikTheRed and Monsign Dragon above are correct. Virtually everyone raising the point that somehow the head end (Google, Yahoo, etc.) of the connection isn't paying for their bandwidth utterly misses the point that both parties have paid for that connectivity. What's more, by attempting to overlay what is, in effect, a cable TV model (in which the retail ISPs get to charge content originators for distribution that those customers have already paid for), the ISPs open the door to degraded service or even wholesale blockage. The former is already the case with Netflix. It is entirely too easy to see such a system being used, with the force of law behind it, as a de facto censorship regime. Right, which is why Netflix's Los Angeles area peer, Level 3, offered to pay for the upgrades including the cost of fiber. These are relatively speaking trivial costs. Verizon et al. are intentionally strangling the connection in order to get a horrible payment model foisted on consumers.